Qiaobing Xu, Ph.D., an assistant professor of biomedical engineering in Tufts University School of Engineering, has received a $498,899 Faculty Early Career Development (CAREER) award from the National Science Foundation (NSF) to fund research into a new way to deliver protein-based cancer-fighting drugs and other therapeutics into cells. Chemotherapy drugs attack all actively dividing cells—healthy and diseased alike—often causing significant side effects in the patients. New protein-based therapy, such as cytokines, monoclonal antibodies and growth factors, allow for highly targeted treatment. The problem is that, unlike compounds used in chemotherapy, proteins are too large to easily cross the cell membrane to penetrate into the cell cytoplasm. Instead, most of these protein therapies work by targeting specific receptors on the outside surface of diseased cells. The NSF program supports junior faculty who exemplify the role of teacher-scholars through outstanding research, excellent education and the integration of education and research. Xu is developing a method way to transport the protein inside the cell safely and efficiently by binding it with a nanoparticle that can cross the cell membrane and, when safely inside, release the protein. In his approach, the protein is first chemically altered to give it a negative charge and then bound to a positively charged nanoparticle composed of lipids. The lipids then pass through the cell membrane, which is naturally negatively charged. This entry was posted in Biomedical Engineering, Departments, Engineering for Health, Engineers, Faculty, Research News on May 28, 2015 by Julia Keller. 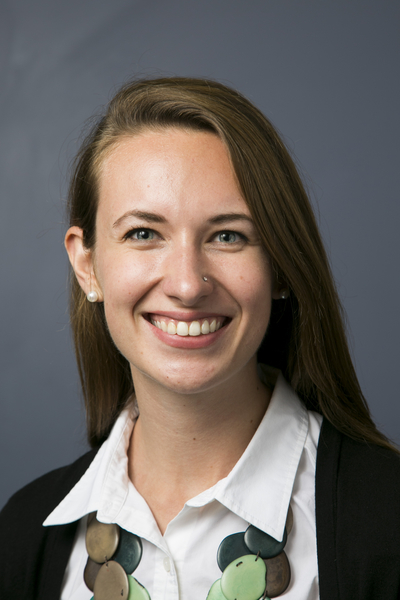 Laura Read, a doctoral student in the Water Diplomacy | IGERT program, won one of two top prizes for the DOW Sustainability Innovation Student Challenge Award (SISCA). Her proposal, based on research with Professor Richard Vogel, seeks to better prepare engineers to incorporate the effects of climate change and urbanization into the design of flood management solutions. Doctoral recipient Will Farmer, also an advisee of Rich Vogel, received an honorable mention for his proposal on sustainable water management in ungauged basins. Congratulations, Laura and Will! This entry was posted in Civil and Environmental Engineering, Departments, Engineers, Environmental Sustainability, Research News, Students, Women Engineers on May 27, 2015 by Julia Keller. Maggie Stevens, a doctoral student in Associate Professor Tom Vandervelde’s REAP Lab, received funding to spend the summer working at the Naval Research Labs through the prestigious Naval Research Enterprise Internship Program. She will be working with the Robert Walters group at NRL on epitaxial processes and characterization. Stevens also received funding from NASA for her proposal “Solid State Energy Conversion for Deep Space Power.” NASA Space Technology Research Fellowships are awarded to graduate students who show significant potential to contribute to NASA’s goal of creating innovative new space technologies for the United States’ science, exploration and economic future. This entry was posted in Departments on May 22, 2015 by Julia Keller. Professor and Chair of the department Kyongbum Lee was inducted to the American Institute for Medical and Biological Engineering (AIMBE) College of Fellows. Lee was nominated, reviewed, and elected by peers and members of the College of Fellows for outstanding contributions at the interface of biochemical and biomedical engineering through integrated modeling and experimental studies on cellular metabolism. Associate Professor Irene Georgakoudi (BME) was nominated, reviewed, and elected by the AIMBE College of Fellows for outstanding contributions to the development of label-free optical methods for cancer diagnosis and tissue engineering applications. This entry was posted in Biomedical Engineering, Chemical and Biological Engineering, Departments, Engineers, Faculty, On and Off Campus on May 21, 2015 by Julia Keller. The Association of Environmental Engineering and Science Professors (AEESP) has recognized Associate Professor C. Andrew Ramsburg with its Award for Outstanding Teaching in Environmental Engineering and Science which recognizes his outstanding contributions to the teaching of environmental engineering, both at Tufts and in the larger community. This entry was posted in Civil and Environmental Engineering, Departments, Engineers, Faculty on May 20, 2015 by Julia Keller. Peter Balonon-Rosen of WBUR’s Learning Lab blog wrote a piece about the Center for Engineering Education and Outreach (CEEO) and their work with student at Malden High School. In the piece “Inquiry-Based Arts And Engineering Space Enriches Student Learning“, Balonon-Rosen talks with Assistant Professor Ben Shapiro about the CEEO and the value of maker spaces. “Historically when you look in schools where there is inquiry-based learning, it’s the kids who are sort of on the most high-track academic track who get that in their classes and the kids who are not there tend to have much more traditional didactic instruction,” said Shapiro, a McDonnell Family Professor of Engineering Education at Tufts University, who helped secure the grant. “We wondered if we could … create conditions in the school where all kids, including the kids who are not seen as the most-likely academic high achievers, get to do inquiry as part of their everyday learning,” Shapiro said. This entry was posted in Center for Engineering Education and Outreach, Engineers, On and Off Campus, Students on May 19, 2015 by Julia Keller. Linda Abriola, dean of the School of Engineering and a professor of civil and environmental engineering, has been named a University Professor, the highest academic honor conferred at Tufts. It is a distinction currently held by just four other faculty members here. Abriola is the first woman to receive the appointment. Abriola, who has been dean since 2003, was one of the first to develop a mathematical model that describes the migration of organic liquid contaminants in the subsurface—or, more simply, how organic chemical pollutants travel within and contaminate our groundwater resources. She is particularly known for her work on the characterization and remediation of underground aquifers contaminated by chlorinated solvents, a family of chemicals used as degreasers and in dry cleaning that are known carcinogens and harmful to ecological health. The president and provost recommend faculty for University Professorships, which are approved by the Board of Trustees. The designation is an honor reserved for faculty of unusual scholarly eminence who are also exemplary citizens of the Tufts community. “This appointment honors Linda Abriola for her work as a transformative leader of the School of Engineering and the university, as well as her outstanding reputation as a researcher in the field of groundwater remediation,” said Provost David Harris. This entry was posted in Civil and Environmental Engineering, Departments, Engineers, Faculty on May 18, 2015 by Julia Keller.